To get to the top of the search engines can take a whole lot of tweaking, and the services of a top notch SEO copywriter can be a big help. There are countless ways in which you can optimise your website for search engines, and if you’re just starting out with your website the prospect can be a daunting one. Here, we take a look at five important things to consider in your quest for the top spot on Google and the other search engines (remember, Google isn’t the only player in town…). Create plenty of content – The more content you have on your site the better from an SEO perspective. That doesn’t mean you should go filling your web space up with junk just for the sake of it. 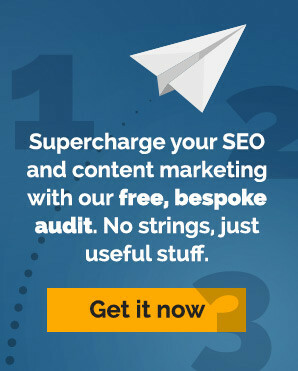 But if you’ve only got the bare minimum (home, about us, contact us etc), you might want to consider hiring an SEO copywriter to create some additional content. Ideas for extra content to draw in attention from search engine spiders and web users include ‘how to’ articles, news items, blog entries and other useful resources that will keep the search engines and, more importantly, your human visitors interacting with your site. Careful with the keywords – When it comes to keywords, it’s all about balance. Too few and you may have trouble getting your site to rank anywhere near the top. Too many and you risk your content looking sloppy and being virtually unreadable. There is no magic quantity of keywords that will boost you to the top of the search engine results, so one of the best strategies is to identify the best keywords for your site and then use them naturally and unforced in the flow of your copy. Use descriptive anchor text for links – Instead of writing generic text for internal links, such as ‘click here’, use words that are relevant to your pages – ideally, your keywords. Make sure your content’s unique – Duplicate content is virtually ignored by the search engines, and the practice of aggregating content from other websites is also being clamped down on. The only sure way of getting the search engines to pay attention is to create your own high quality original content, and keep it fresh, updated and relevant. Make sure your SEO copywriter understands this too. Focus on making your site as useful as possible – When thinking about SEO, it’s easy to get bogged down with keywords, algorithms and the like. At the most basic level, your website should be optimised to be user friendly and provide useful content. Why? Because that’s exactly what the search engines are looking for, and what web users expect. Is your website optimised to succeed? What tips would you add to this small selection? Let us know in the comments section below. ← Ask an SEO copywriter: How do I use keywords with video?